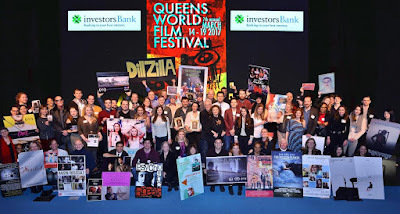 On Valentines Day the Festival producers, filmmakers and other invited guests gathered at MOMI in Astoria to help kick off the festivities leading up to the 7th annual Queens World Film Festival. Over 50 filmmakers from around the globe and around the boro were in attendance joined by Sponsors, Elected Officials and QWFF community partners. QWFF Artistic Director Don Cato introduced special guests (filmmakers, honorees, Sponsors and partners) and announced the final selections/schedule/special events/venues & Honorees for The 7th Annual Queens World Film Festival (QWFF) at the Museum of the Moving Image‎ (MoMI), in Astoria, Queens, NY. The Festival is Scheduled for March 14-19, 2017. Each year, the Queens World Film Festival pays tribute to an outstanding filmmaker for his or her body of work. This year's "Spirit of Queens" Award goes to Queens native independent film director Julie Dash. Her 1991 masterpiece, “Daughters of the Dust” will be showcased at MoMI on Wednesday night, March 15 7-10pm. The screening will be followed by a conversation with Ms. Dash. The incredible Illusions by Ms. Dash will also be screened within another BLOCK of films screened at MoMI on Friday March 18. Highlights of the Festival include the March 14, Opening Night at MoMI kick off at 7pm with a VIP reception with the 2017 filmmakers and 2017 Honoree Julie Dash and other special guests. The program starts at 8:00 and Queens native Ms. Dash will receive the 2017 Spirit of Queens Award for her outstanding contribution to cinema – indie or otherwise. Her work is majestic and intimate, assertive and nuanced. The night will also feature NYC’s elected officials, QWFF sponsors and partners and five short films that will give the audience a glimpse of what is to come during Festival Week 2017. Adam Green’s Aladdin features Macaulay Culkin (Home Alone) leading an enthusiastic cast through the wildest adaptation of this classic that you will ever see. Also staring Alia Shawkat (State of Grace, Arrested Development, Search Party). World Premier of Searching for Fortune staring John Heard (The Sopranos, Big, The Milagro Beanfield War, Awakenings, Home Alone, Radio Flyer, The Pelican Brief, White Chicks, Miami Vice, etc. etc. etc.) A family drama about a woman who tracks down her recently deceased husband's brother and reveals a 25 year old family secret. North American Premier of Scumbag (World Premier at the prestigious International Film Festival at Rotterdam) "The Wolf of Wall Street" meets "Kids" starring every punk legend since the 70s'. starring Princess Frank, Debra Haden, Nick Zedd, Michael Alig, Neon Music, Goddess Bunny, Keith Morris, Angelo Moore, Monique Parent, Jael De Pardo, Don Bolles, Kid Congo Powers, Scott E. Myers, Ron Jeremy, Cindy Lucas, Penny Arcade, Nina Hartley, Brian Soigne and Deluxe Wilso. AFTER SCHOOL by the rising star Alec Tibaldi, an alumni of QWFF, who’s 2016 film Ride or Die won the QWFF 2016 Best Ensemble Award. AFTER SCHOOL is another sterling example of great directing, acting and production and stars Ruby Modine (Shameless) and the young and extremely promising Piper De Palma whose father is film director Brian De Palma. And there are 130 more incredible, intriguing, challenging, works including 4 about the undocumented Immigrant experience and four more featuring challenging mental health conditions. There 6 beautiful LGBT films, an animation about brotherly love that will break your heart, thrillers, chillers and all out high high camp. The World’s Borough is well represented with 23 films from Queens, 16 from Manhattan, 17 from Brooklyn and 1 from the Bronx. There are 12 from Germany, 7 from Spain, 4 from Iran and 8 films are by Asian filmmakers from all over NYC. We have 50 films by women and three films that were collaborative efforts from educational institutions.